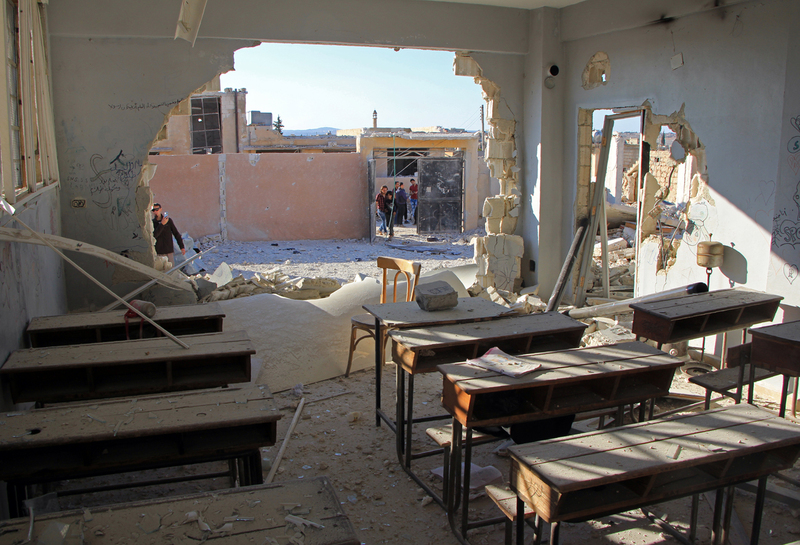 A general view shows a damaged classroom at a school after it was hit in an air strike in the village of Hass, in the south of Syria's rebel-held Idlib province on Oct. 26, 2016. Moscow is calling for a thorough investigation of the attack on a school in the Syrian province of Idlib and other incidents, Russian Foreign Minister Sergey Lavrov said after meeting with his Syrian counterpart, Walid Muallem, and Iran’s top diplomat Javad Zarif. "The Idlib school attack has been very much hyped lately," the Russian minister said. "The allegations particularly lay the blame on Russia and Syria. We are being accused of delivering the airstrikes that hit the school. In response to these assertions, Russia’s Defense Ministry has shared some facts that disprove the accusations and show that this media hype has been biased." "I would also like to mention that on the same day a mine hit a school in western Aleppo and at the same time, militants from eastern Aleppo shelled a humanitarian corridor set up near that school," the minister continued. "As a result, 12 civilians were killed and 20 wounded. It is impossible to distort this information. Our journalists have visited this area and recorded this absolutely inhuman crime that the insurgents active in eastern Aleppo had committed." All these incidents need to be thoroughly investigated, the Russian top diplomat stressed. At the same time, Lavrov noted that "Russia and Iran welcome the Syrian government’s readiness to enhance cooperation with the UN in tackling humanitarian issues, that was confirmed today". "We believe that the UN representatives should act impartially, and refrain from responding to provocations," the Russian minister emphasized.